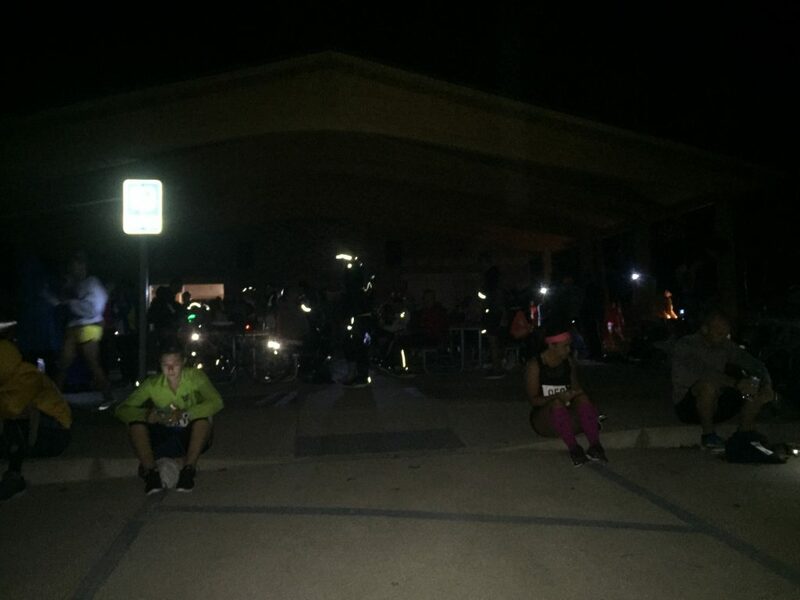 It was still so dark but kind of cool because everyone had flashlights and the race provided some illumination. We set up our folding chairs near the main pavilion and hunkered down. 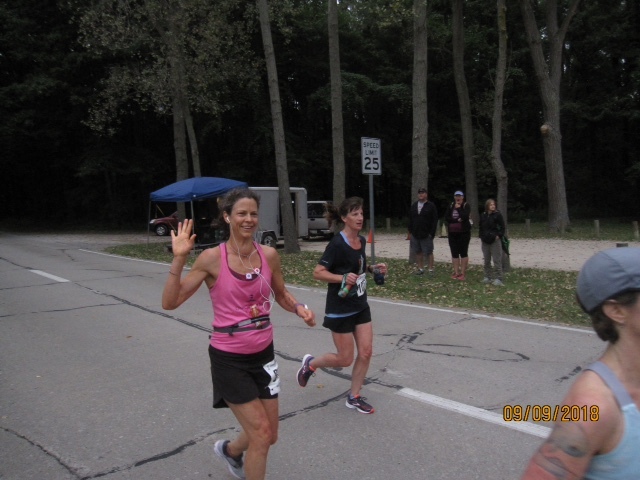 This race was so much about the mental side of running for me. I’ve found Deena Kastor’s book Let Your Mind Run incredibly inspiring as an instruction manual for mental training. Shaping your thoughts in a positive direction turns out to be an incredibly effective tool both for training and for racing. About a month before Erie, I picked it up and started reading it again. I loved when her coach told her “Define Yourself” before one of her races. Running a faster marathon necessitates an identity shift. On paper, I have been a 4:09 marathoner, but I knew I had the fitness level to be a sub-4 hour marathoner. I practiced thinking of myself like that. That’s one way I wanted to define myself. Tthe training was done. The logs were written. The race itself was the only thing left to write. Coach Mick is also fabulous with mental preparation. 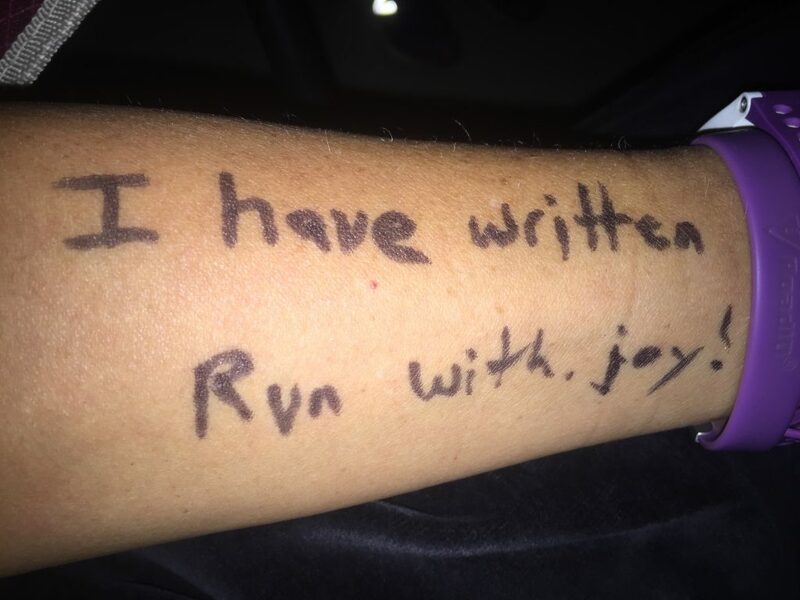 After we discussed pacing strategies, he said that more important than running a particular pace at a particular mile in the race, I should find a way to run with joy in my heart. He said he didn’t care what time I ran at Erie as long as I found some joy on the course. About a week before the race, I had also booked a phone call with Justin Ross, a sports psychologist who works with the Another Mother Runner group. I had done a group webinar with him, but I wanted an individual discussion as well. Justin gave me some great tips on how to mentally approach an important race. One of my concerns about Erie had been lining up alone. I ran almost all of my previous marathons with a friend at my side because I am exceptionally good at talking people into stuff. But Justin and Coach Mick both noted that being alone could be an advantage. I had total control and didn’t have to worry about other people’s needs. Justin gave me a pre-race guided meditation that I practiced with beforehand. He talked about the balancing act between your desire to achieve a goal versus the pain of the race. You can adjust the pain level you feel at a given pace through training, but you can adjust the desire side of the balance by focusing on why you race. I went into Erie with a lot of clarity about my “why”. Before the race started, then, I was calm and in a really good headspace. I had done a lot of pre-race visualization. I had gone over my training logs. I had reviewed my long runs and some critical races from last spring. I had written it already. I just needed to execute it. About 6:20am, I had my Five Hour Energy Shot. I started my warm-up with the pre-race meditation and then my standard lunge matrix and leg swings while listening to “Unwritten”. I did some quick strides and a couple of drills, but mostly conserved energy for the race. A last-minute pit stop in the bushes turned comical when I wasn’t the only one with that idea. They should put doors on those things! By 6:50am, I headed to the start to line up. They had the runners on a side road with pace signs as suggestions. I’ve never been to a marathon before where the field was skewed so fast. I’m guessing 75% of the runners lined up for sub-3:30 marathons or faster. Amazing. I found Pacer Chris from the expo and hung about with him while he cracked jokes. The gun went off and we headed out. Usually at the beginning of a race there’s loads of congestion, bumping around people, that sort of thing. Not here! They changed up the start at Erie two years ago to fix this problem and by 1/3 of a mile into the race, we were running smoothly with no one in front of us. Great job Erie Marathon! Pacer Chris and some others in the pace group were chatting up a storm, but I was very quiet. I don’t like to chat much while racing, especially with people I don’t know. Also, I realized pretty quickly that despite near perfect race day preparations, I didn’t feel that great. I had been SO calm before the race, but now that we were moving, I felt quite anxious. Usually that’s the reverse! My pre-race nerves go away once I start running! This time I felt what I imagine was a whole lot of adrenaline getting dumped into my system, quicker than I was managing to process it. What the hell? Luckily, I had resources for figuring out what to do. I had had very good advice from HPRM#1, from Coach Mick, from Justin, and from reading books and articles by professional athletes. They all recommended visualizing the race, but not just the good outcomes. Visualize the bad surprises, the stuff that could go wrong and how you’ll cope. First I figured I would just calm down after a mile or two. The first couple miles are sort of garbage miles anyway and I had barely run as part of the warm-up. So I figured it would feel better soon, and it did. By the time I passed my parents at 2.5 miles, I was able to give them a genuine wave and a smile. Maybe things were settling down. As the next few miles clicked off, though, it just felt like more work than I would have liked. This should be the easiest part, I thought! And it was pretty easy! The weather was cool for a change instead of hot and crazy humid. My body felt fine, including my foot, which wasn’t bugging me at all! After a flare-up of the dreaded plantar fasciitis in August, my foot was fine. I just had to get my brain to cooperate. Having originally planned to leave Pacer Chris at 3-5 miles, I decided I had better stick with him a bit longer. It was crystal clear to me that this guy was going to cross the line at exactly 3:54:30 and if I stuck with him, I would do the same. I turned on my music to try to zone out a little more and ran just a few steps ahead of the pace group. I could hear them but felt a little more isolated. I had thought I might stick with him for as long as 10 miles, but by 7.5, I had to be alone. On a different day, I might have loved running with Pacer Chris and I think he would be a blast to have a beer with, but I wanted more room below a 3:55 finish time. 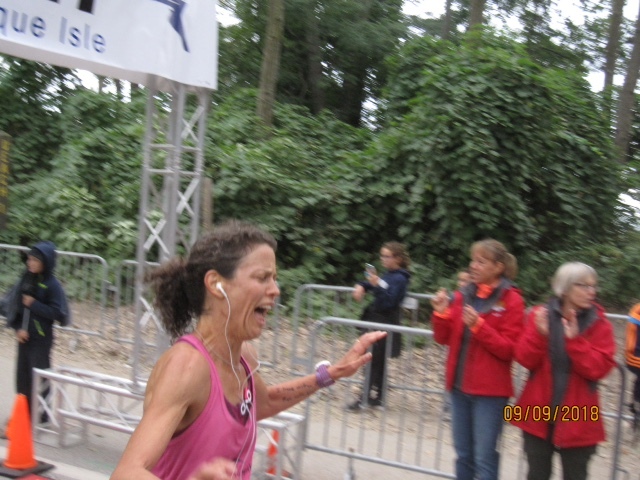 And I remembered Coach Mick’s #1 piece of advice: Run with joy in your heart. I wasn’t finding any joy and I knew I needed to. Speeding up a little made me much happier. I switched to 8:45s and started to pull gradually away from the pace group. 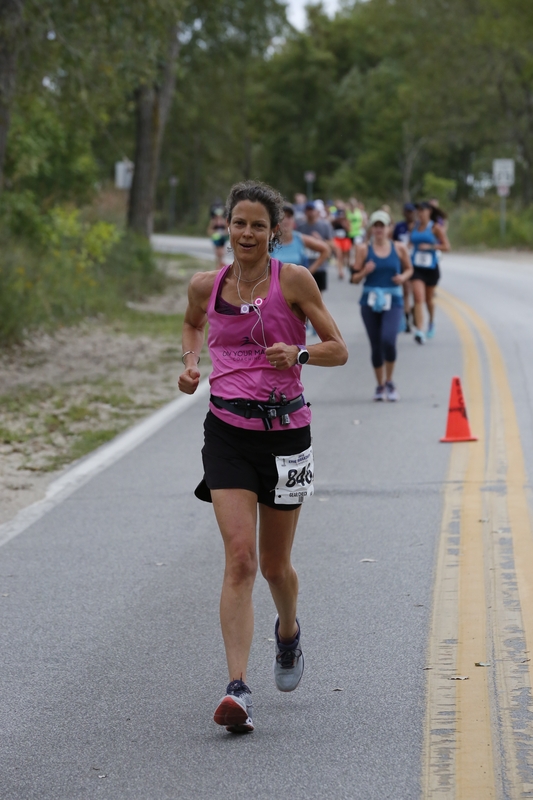 After leaving the pace group, I felt much better and found a groove. The course is really pretty out there, though there are almost no spectators. I didn’t mind that. There was lots of natural beauty to look at and plenty of runners. Erie also has water stops every single mile so it feels like “something happens” pretty frequently even without urban landmarks or people cheering. We did pick up some wind, but this was one of the best parts of the race for me. Miles 10 through 12 were also pretty good. This was the only portion of the race where we somehow had a tailwind. I was so happy to see my family around 12 miles. I was genuinely smiling and waving. And then, as a surprise, right before the halfway mark, I saw Barley out cheering with her baby! What a bonus! At that halfway mark/turnaround, I could also see that I was between the 3:55 and the 3:50 pace groups. Hmmm. Could I catch 3:50? I would have loved that, but it was not to be. Not this time, anyway. At 14 miles was the first moment I believed I would BQ. Yes, that’s ridiculously early in the race to have that feeling, but I already knew I had a good shot at it. It wasn’t a done deal, yet I felt I would do it. That lifted my mood, but I still experienced the typical racing mood swings: high spirits mingling with darker thoughts. I saw my parents at Mile 15.5 and did smile-and-wave again but this one felt more performative. That’s ok. I could actually feel the Kipchoge effect. Whenever I could smile, the running felt easier. Maybe it’s also the Deena effect: positive thoughts lead to a positive mindset leads to stronger running. Of course, good patches are followed inevitably by bad patches and one was about to arrive. After seeing my parents, I knew I wouldn’t have any personalized cheering again for the next seven miles. The course got quiet again, there were fewer runners clustered around me now. Then the wind picked up. Naturally it was a headwind. At 16 or 17 miles into a marathon, you are starting to get tired, but still have a long way to go. I celebrated having single digits remaining, but I also had to start calling on more mental resources to get through it. Coach Mick had talked about playing with the wind, something Deena thinks about too. I imagined the wind as a bunch of enthusiastic puppies, jumping on me, and me joyfully pushing them back down. One of my biggest sources of inspiration was the lake itself. 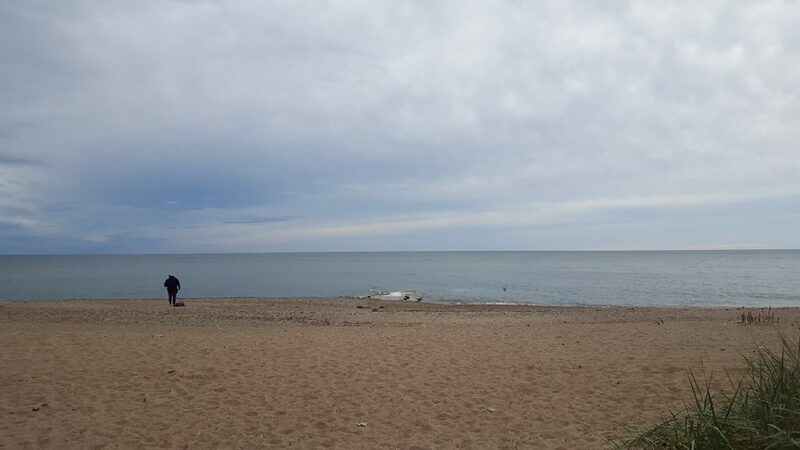 From the moment I chose this marathon, I knew I would love running alongside one of the Great Lakes. We spent some time at the Lakes this past summer. As a child, my family took lots of vacations on Lake Michigan. I grew up knowing the beauty of these waters. Whenever I could see the lake itself, I imagined the enormous power of that water flowing into me. I thought of the city of Erie. I love rust belt cities. A place with a wealthy past, more recent economic troubles, but a strong scrappy spirit. Des Linden territory, I thought. She would fit right in here. This place is genuine, no façade possible. Just as I had hoped, the geography, the water and the land, helped me find that kind of scrappiness within myself to not give up when things got hard. With the wind and the miles dragging on, things were getting hard. I had planned all along to pick up the pace at mile 20, if at all possible. But at mile 19, I heard the chatting Pacer Chris in the distance behind me. Uh oh. He wasn’t that far back. I did not want that guy to catch up to me. Then I would have to work to stay with him instead of being on my own. Go time at Mile 19 then. Somewhere in here I also started feeling a little nausea. Not terrible, but I don’t generally feel any when running. I’m not sure I ever have. This is such a common problem though, that I had absolutely visualized it happening. I just decided that I wasn’t going to let it affect me and kept running. I’m sure under some circumstances that wouldn’t work, but under my circumstances it did. I also decided to lay off the Gu and water for the rest of the race. Pacer Chris was too damn close. I’d been great about hydrating and fueling until that point and I thought I could get away with not doing it anymore. “Only” seven miles to go, after all. Looking back, I’m not sure that this was a wise choice. Physically, the race was pretty rough from Mile 19-23. My legs were tired. It felt like I was running 5K effort, but I’d have to keep it up for 7 miles. My legs and especially my feet felt so heavy and I longed for my Nike Pegasus Turbo shoes, which are lighter than the Mizuno Wave Riders I was wearing. The Mizunos felt like bricks. But, I reminded myself that no matter how heavy my shoes felt, my previously injured foot felt completely fine. I chose the Mizunos for the marathon because they seemed the best at keeping the PF at bay, so that was totally worth it. Whenever I lost focus, even momentarily, I would slow down. If I could stay focused on my turnover, I could run faster, so I thought about moving my legs as quickly as I could. Miles 20-23 were all 8:47-8:49, so it worked. I saw my parents at Mile 23 and didn’t wave or smile this time. Three miles to go. Of course the devil came along to offer his deals: You’ve already got the BQ in the bag. Pacer Chris is running 3:54:30, that’s good enough. You could be a minute slower, probably 90 seconds slower, and still run Boston. This is too hard and it’s not necessary. But I had no interest whatsoever in those deals. Like I always do when it gets hard, I counted. I counted and counted and counted and clicked down those never-ending miles, feeling like total crap, but wanting so badly to stay ahead of Pacer Chris. I just kept running and counting and thinking about my foot turnover until I finally saw the finish line, which also seemed wildly far away. But now I knew every second mattered so I pushed as hard as I could until I crossed the line. My watch said 3:54:07. Official clock results: 3:54:05. I beat Pacer Chris! And I qualified for Boston by 5 minutes, 55 seconds. PR by 14 minutes, 58 seconds, which yes, I am rounding to 15 minutes. I split the race in 1:56:31/1:57:34, which is really satisfying. I’ve never run such an evenly split marathon. The finish line area at Erie is really small. My husband and the kids were right there and I could collapse into my husband’s arms over the fencing. He held me up and I just cried a bit. I couldn’t believe it. I had done it! Everything hurt. I was pretty shaky. I was totally overwhelmed. I was beyond happy. I was there quite awhile before moving away to get my medal and water and heat sheet. The volunteers could see I was in rough shape and one of them eventually walked me out, which was only about 30 feet anyway. I grabbed something I thought was going to be a dry bagel but ended up being half an apple fritter. SCORE! I was able to sit down and recover a bit and call Coach Mick. I talked to HPRM#1 in the car on the way home. Having just written the longest race report ever, I still don’t think I have a way to express what this race means to me. I’ve been chasing Boston a long time. Catching the unicorn isn’t the end stage of my running career but it’s a damn important moment along the way. HPRM#1 says I am going to feel different after this and I suspect he’s right. I know that was probably the best executed marathon I’ve ever run. I know what I’ve learned about running and myself in the past year or two. I am a different person than I was before. Congrats, what a great report!!! First comment, i just had to say what a fabulous race report. It sounds like an amazing race, and I think I’ll be reading this again before my first race in 4 weeks time (a half). Congrats on the BQ.